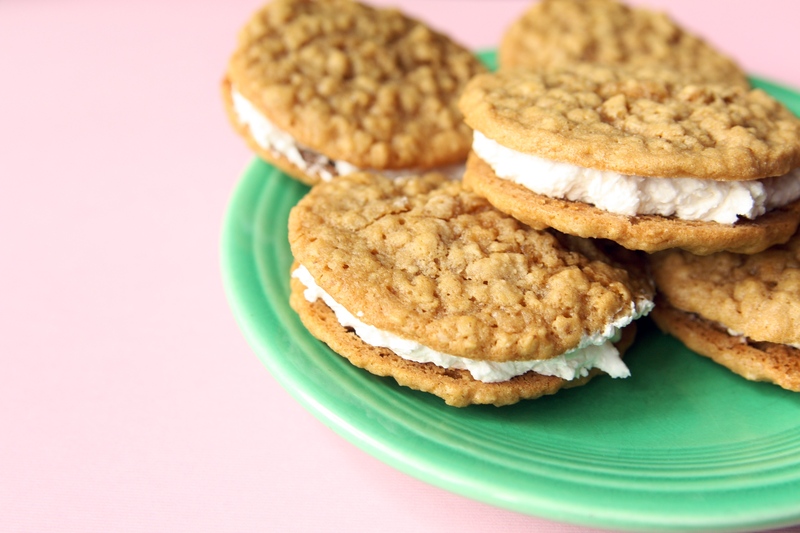 Who doesn’t love a Little Debbie Oatmeal Cream Pie? This recipe sure comes close. In large bowl, cream margarine, sugars, vanilla, and eggs. Combine flour, salt, baking soda, and cinnamon. Add to the creamed mixture; mix in the oats. Drop dough by TBS on ungreased sheets. Bake at 350 degrees F. Bake for 10-12 minutes,or until just starting to brown around the edges. They will look moist; don’t overcook. In small bowl, dissolve the salt in the hot water. Allow this to cool. Combine marshmallow cream, shortening, powdered sugar, and vanilla in med bowl; mix on hi until fluffy. Add the cooled salt water and mix well. Spread filling on flat side of one cookie, press 2nd cookie on top. My husband lives those so I’m definitely going to have to try this recipe. The original calls for a bit of molasses Patty, Matt and I thought they tasted better without it.